I got this from Tim Knight's Slope of Hope blog. I still think this is one of the funniest things I've ever seen. High-yield, high-risk bond sales almost tripled to $2.38 billion this week, the most in seven months, as borrowers took advantage of a rally in corporate debt to increase cash reserves and pay down credit lines. Forest Oil Corp. of Denver raised $600 million in the largest junk bond offering this week, while Nashville, Tennessee- based hospital chain HCA Inc. sold $310 million of notes, according to data compiled by Bloomberg. Both came to the bond market to repay bank debt. Borrowers concerned that a weakening economy and deteriorating earnings may shut off their access to the debt markets are taking advantage of the lowest yields since October relative to Treasuries to issue debt. Companies see an opportunity to raise cash and repay credit lines, said Pete Brady, managing director of high-yield bond trading at Broadpoint Capital Inc. This week’s high-yield bond sales compare with $796 million the previous week and were the highest since the period ended June 26. That week’s $2.8 billion of sales excluding conversions of bridge loans to bonds was led by Ottawa-based Telesat Canada, a provider of fixed satellite services, and BE Aerospace Inc., the world’s largest maker of aircraft-cabin interiors, Bloomberg data show. Junk-rated borrowers raised $8.5 billion in June. BE Aerospace is based in Wellington, Florida. German economic growth posted its sharpest quarterly fall since 1987, as machinery investment and exports nose-dived, data from its Federal Statistics Office showed Friday. Real GDP declined 2.1% from the third quarter, when adjusted for seasonal and calendar effects, well below economists' forecasts of a 1.8% quarterly fall. This was the third quarter in a row that German GDP declined, after falling by 0.5% in the second and third quarters of 2008 respectively from the quarter-earlier periods. The loss also marked the sharpest quarterly drop in GDP since the first quarter of 1987, when GDP declined by 2.5%. Germany, the euro zone's largest economy, is widely expected to contract 2%-3% this year, which would mark the steepest decline since World War II. France's finance ministry, meanwhile, said late Thursday that GDP in the euro zone's second-biggest economy contracted 1.2% in the fourth quarter -- also more than the 1.0% decline expected by market participants. It said GDP should contract by at least 1.0% this year on average. In a radio interview earlier Friday, French Finance Minister Christine Lagarde said the country was, "clearly in a recession." In Italy, GDP shrank 1.8% on a quarter-to-quarter basis between October and the end of December, the sharpest decline since 1980, after contracting 0.6% in the third quarter. Eurostat said the EU economy as a whole slipped into recession in the final quarter of last year. EU GDP shrank 1.5% on a quarter-to-quarter basis after declining 0.2% in the previous three-month period. There are several reasons why this is an important and scary development. 1.) For some time there was a theory that the US economy would decouple from the rest of the world. In other words, the US would have a recession but Asia and Europe would not be effected. This theory is obviously wrong and is now formally dead in the water. 2.) Exports of US goods were a bright spot in US GDP reports for some time. That is no longer the case. 3.) 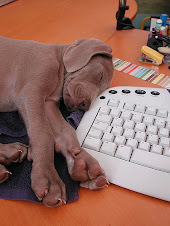 The recession is now global -- it's hitting everybody hard. That means we've got some really big problems to deal with. 4.) Asia which exports to everybody has to deal with another export market in decline. That means Asia is also negatively effected by this. On the daily chart we can see a solid triangle consolidation pattern forming. Also note the 10 and 20 day SMA are moving higher while the 50 day SMA is moving lower. The MACD and RSI aren't much help on this chart as both are pretty stagnant right now. I'm having trouble uploading images. I'll post this in the morning. 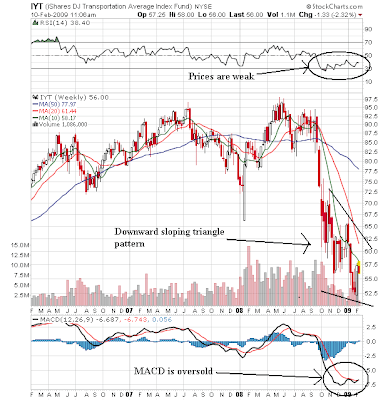 Is the Energy Sector Stabilizing? 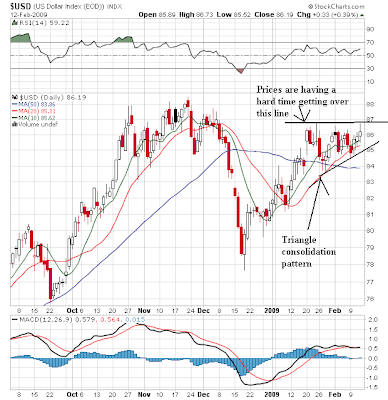 The oil service holders trust is in the middle of a triangle consolidation pattern and has been for over two months. Note the rising bottom of the triangle. This tells us that traders are setting higher and higher bottoms as buy points. 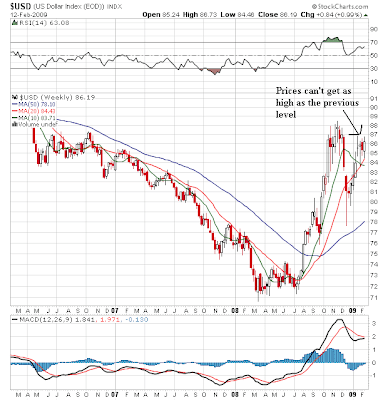 Prices and the SMAs however, are in a tight range. Neither is giving a firm signal either way. The gas exploration and production ETF has moved around in a 5 point range for the last month. Prices and the SMAs are in a tight range and aren't giving us a big signal one way or the other. The point with this chart is -- so far -- is hasn't moved any lower. The XLEs have been in a back and forth range for the entire year. Again, this is a sign of consolidation. While there is no news moving the market higher yet (thanks to oil prices being at lows) prices in this sector are clearly stabilizing. The energy sector is an important part of the economy and the market. All of the charts above indicate consolidation and the possible forming of a base. However, we won't know if this is a base of a consolidation before a move lower until prices move one way or the other. The Federal Reserve is engaged in an ongoing assessment of the effectiveness of its credit-related tools. Measuring the impact of our programs is complicated by the fact that multiple factors affect market conditions. Nevertheless, we have been encouraged by the responses to these programs, including the reports and evaluations offered by market participants and analysts. Notably, our lending to financial institutions, together with actions taken by other agencies, has helped to relax the severe liquidity strains experienced by many firms and has been associated with considerable improvements in interbank lending markets. For example, we believe that the aggressive liquidity provision by the Fed and other central banks has contributed to the recent declines in Libor and is a principal reason that liquidity pressures around the end of the year--often a period of heightened liquidity strains--were relatively modest. There is widespread agreement that our commercial paper funding facility has helped to stabilize the commercial paper market, lowering rates significantly and allowing firms access to financing at terms longer than a few days. Together with other government programs, our actions to stabilize the money market mutual fund industry have also shown some measure of success, as the sharp withdrawals from funds seen in September have given way to modest inflows. And our purchases of agency debt and MBS seem to have had a significant effect on conforming mortgage rates, with rates on 30-year fixed-rate mortgages falling close to a percentage point since the announcement of the program. All of these improvements have occurred over a period in which the economic news has generally been worse than expected and conditions in many financial markets, including the equity markets, have worsened. Analysts say rock-bottom official interest rates, promises of massive fiscal-stimulus packages and central banks' other efforts to revive markets have helped ease some tensions in financial markets and may help put a floor under falling business confidence. As the government rescue efforts work their way through the markets, they could lay the groundwork for the global economy to begin escaping the worst of the storm. A key barometer for financial-sector health -- the London interbank offered rate -- soared in the fall after Lehman Brothers Holdings Inc. filed for bankruptcy, because banks quit lending to one another. On Wednesday, the three-month dollar Libor inched up to 1.23% on disappointment about the Treasury Department's financial-stability plan, but has been easing since the start of the year and is down sharply since its peak of 4.82% on Oct. 10. Also in financial markets, issuance of high-rated corporate bonds is soaring, signaling that markets could be getting back on track to serving their core purpose -- providing funds to firms that need them. Short-term corporate credit markets also have shown signs of improvement. Interest rates on short-term commercial-paper financing agreements have come down, and firms have become less reliant on a special Federal Reserve facility serving commercial-paper borrowers. Since the start of the year, companies world-wide have sold $264.4 billion of investment-grade corporate bonds that aren't guaranteed through a government program, according to research firm Dealogic. That is up from the fourth quarter of last year, when companies sold on average $82.9 billion of non-government-backed debt a month. That article then notes these readings are coming from very low levels. One analyst notes, "things are simply less bad", which is an incredibly salient point. But as Bernanke notes, things are stabilizing (or at least seem to be). Not much has changed since last week's update. The market is still technically oversold, as indicated by the extreme MACD and RSI readings. All the SMAs are still moving lower, and the shorter SMAs are still below the longer SMAs. Prices are caught up with the 10 week SMA. In addition, we can also see the triangle consolidation pattern forming. The main issue today is the markets didn't go any lower after yesterday's swoon. The spy was up about .6%. the market traded to the 61.8% Fibonacci level but couldn't get any higher. Considering yesterday's damage that's not bad. 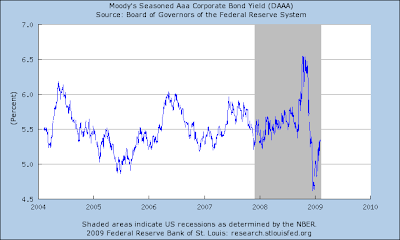 From a fundamental standpoint, the news of the stimulus compromise came at a bad time -- right before the market closed. we'll see if the excitement holds up into tomorrow's open. On the daily chart, the main issue is we stopped the bleeding. The markets tanked yesterday after Geitner announced the Treasury's plan to clean up the banks. The general complaint was a lack of specificity in the plan. So, let's go through it to see what it really says. I'm going to take this in small chunks to get an idea for everything that's involved. # Increased Transparency and Disclosure: Increased transparency will facilitate a more effective use of market discipline in financial markets. The Treasury Department will work with bank supervisors and the Securities and Exchange Commission and accounting standard setters in their efforts to improve public disclosure by banks. This effort will include measures to improve the disclosure of the exposures on bank balance sheets. In conducting these exercises, supervisors recognize the need not to adopt an overly conservative posture or take steps that could inappropriately constrain lending. # Coordinated, Accurate, and Realistic Assessment: All relevant financial regulators -- the Federal Reserve, FDIC, OCC, and OTS -- will work together in a coordinated way to bring more consistent, realistic and forward looking assessment of exposures on the balance sheet of financial institutions..
# Forward Looking Assessment – Stress Test: A key component of the Capital Assistance Program is a forward looking comprehensive "stress test" that requires an assessment of whether major financial institutions have the capital necessary to continue lending and to absorb the potential losses that could result from a more severe decline in the economy than projected. # Requirement for $100 Billion-Plus Banks: All banking institutions with assets in excess of $100 billion will be required to participate in the coordinated supervisory review process and comprehensive stress test. + Capital Assistance Program: While banks will be encouraged to access private markets to raise any additional capital needed to establish this buffer, a financial institution that has undergone a comprehensive "stress test" will have access to a Treasury provided "capital buffer" to help absorb losses and serve as a bridge to receiving increased private capital. While most banks have strong capital positions, the Financial Stability Trust will provide a capital buffer that will: Operate as a form of "contingent equity" to ensure firms the capital strength to preserve or increase lending in a worse than expected economic downturn. Firms will receive a preferred security investment from Treasury in convertible securities that they can convert into common equity if needed to preserve lending in a worse-than-expected economic environment. This convertible preferred security will carry a dividend to be specified later and a conversion price set at a modest discount from the prevailing level of the institution's stock price as of February 9, 2009. Banking institutions with consolidated assets below $100 billion will also be eligible to obtain capital from the CAP after a supervisory review. + Financial Stability Trust: Any capital investments made by Treasury under the CAP will be placed in a separate entity – the Financial Stability Trust – set up to manage the government's investments in US financial institutions. Here's what this looks like to me. Before any money gets lent, the government gets to look under the hood in detail to see what is actually on the balance sheet. My guess is they are doing this for several reasons. -- Will this bank survive? I think this is the key issue. If a bank is on life-support, I don't think (at least I hope) the Treasury will invest any money. Instead they will look for a forced bankruptcy or shotgun merger. Again, that's my read. -- No one knows who owns what. This way we'll know who owns what particular asset. -- This gives them a better idea of which company's are best suited for a forced Treasury shot gun marriage. If the Treasury doesn't like what they see, then they can use this evaluation to start quietly shopping sock banks to one healthier banks. The Treasury and the Fed have forced several marriages over the last year and a half or so. My hope (and perhaps it's a faint hope) is they will continue this trend. Remember -- Geitner is one of the main players behind the Bear Stearns sale -- that is, the behind the scenes movement. 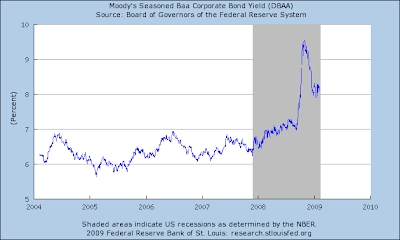 Is the Credit Market Thawing? Executives of Mead Johnson Nutrition Company will ring the opening bell to celebrate the baby formula maker's initial public offering, which will begin trading on Wednesday. The former unit of Bristol-Myers Squibb Company raised $720 million in its IPO at a price of $24 a share, the top of its $21-$24 range. In a sign of healthy interest, the size of the offering was increased to 30 million shares from the initial size of 25 million shares. A growing number of big companies are taking advantage of the thawing credit markets to raise large sums of money at low interest rates, with Cisco Systems Inc. Monday selling $4 billion in bonds to bolster its war chest for acquisitions. The big Cisco offering follows a string of successful efforts just in the past five weeks to tap the market for corporate debt. The size of the offering -- and the relatively low-risk premiums attached to the bonds -- indicate that investors are hungry for debt from highly rated companies. Since the beginning of the year, U.S. companies have sold $78.3 billion of investment-grade corporate bonds that aren't guaranteed through a government program, according to research firm Dealogic. This is up from the December quarter when companies sold on average $21 billion of nongovernment-backed debt a month. The accompanying image gives us some hope. Total commercial paper outstanding shows that asset-backed paper (securitized) started dropping in mid-2007 and has been dropping ever since. In addition, financial paper is still weak. But non-financial appears to be doing well. This chart tells us there are still problems with the financial sector (duh!). This chart shows the commercial paper spread has come down significantly from it's highs at the end of last year. While rates are still high compared to other points during the latest expansion, they are far better then they were. Aside from the spike at the end of last year, AAA paper is doing quite well. Baa paper, however, is still under stress. Bottom line: I'd give all of this news a "C". It's gotten better but we have a long way to go. After a major rally from 2007 to 2008 when prices increased about 2.5 times, prices have come down in a big way, essentially returning to their levels where the rally started. 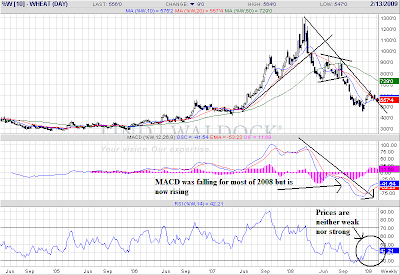 Note how the MACD was dropping hard for most of 2008. Also note for the same time the RSI was dropping indicating prices were getting weaker. 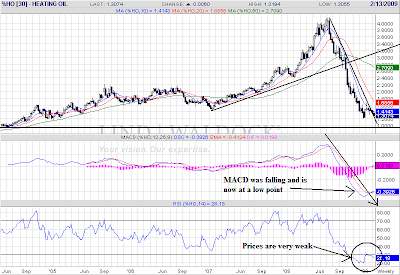 The MACD is now moving higher and the RSI indicates prices are getting stronger. But note the 20 and 50 week SMAs are bother moving lower. In addition, prices have run into continued resistance at the 20 week SMA. Orange Juice has been dropping for almost two years. Prices have essentially taken a round trip and are now back to where they started a few years ago. The MACD has provided no direction indication for the last year and the RSI shows prices are "medium". However, the price/SMA relationship shows a very bearish orientation: the short SMAs are below the longer SMA, all the SMAs are moving lower and prices have run into upside resistance at all three SMAs over the last year or so. Heaing oil has fallen in conjuntion with the oil market. Notice that starting in roughly last summer, prices dropped hard losing about 70%+ of their value. In addition, note the corresponding drop in the MACD, RSI and SMAs. Right now prices look like they are trying to bottom, but until they move higher from this level we won't know if this is the real bottom or just a stop on the way to something lower. The daily chart shows a big and nasty drop. Prices tried to rally at the open but quickly fell. Every time they rallied they ran into the 10 or 20 minute SMA. Bottom line -- this was a "get out now" day in the market. I use the S&P 500 and the transportation average together. The logic is pretty simple. If the economy is expanding, then people will have to ship more stuff from a to b. If the economy is contracting people will have to ship less stuff from point a to point b. When transportation profits are declining, so are transportation profits. When transportation profits are increasing so are transportation stocks. So -- let's see what the transportation averages say. 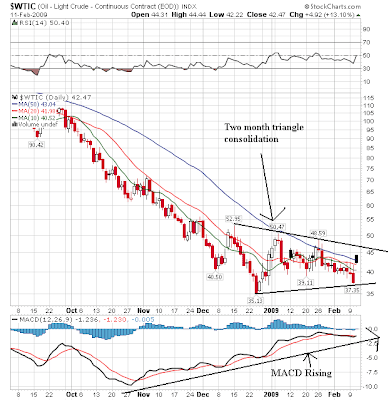 -- Prices are in a downward sloping triangle pattern. The railroad sector recently broke a multi-year upward sloping trendline and is now forming a downward sloping triangle. The sector has dropped about 80 points or about 35% since the thrid quarter of last year. Also notice that the small SMAs are below the larger SMAs and all the SMAs are heading lower. The shipping sector has dropped about 50% (roughly 320 to current level around 150) since the beginning of the third quarter last year. 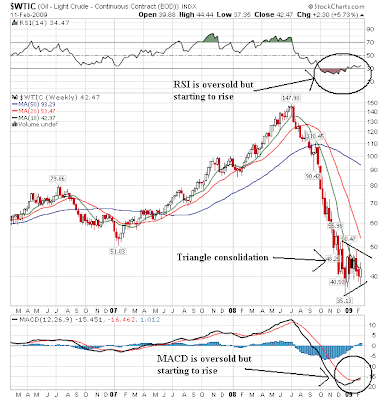 Prices have been forming a triangle consolidation pattern since the beginning of the fourth quarter last year.The SMA picture is bearish, although the 10 week SMA is about to cross over the 20 week SMA which is bullish. The trucking sector has dropped about 120 points since the beginning of July last year. That's a drop of about 22%. Prices have been in a consolidation pattern since the beginning of Ovtober last year. The SMAs are in a bearish pattern, although it appears the 10 week SMA is about to cross over the 20 week SMA. Bottom line: none of these charts is signaling a turnaround anytime soon. I was there when the secretary and the chairman of the Federal Reserve came those days and talked to members of Congress about what was going on... Here's the facts. We don't even talk about these things. On Thursday, at about 11 o'clock in the morning, the Federal Reserve noticed a tremendous drawdown of money market accounts in the United States to a tune of $550 billion being drawn out in a matter of an hour or two. The Treasury opened up its window to help. They pumped $105 billion into the system and quickly realized that they could not stem the tide. We were having an electronic run on the banks. They decided to close the operation, close down the money accounts, and announce a guarantee of $250,000 per account so there wouldn't be further panic and there. And that's what actually happened. If they had not done that their estimation was that by two o'clock that afternoon, $5.5 trillion would have been drawn out of the money market system of the United States, would have collapsed the entire economy of the United States, and within 24 hours the world economy would have collapsed. Now we talked at that time about what would have happened if that happened. It would have been the end of our economic system and our political system as we know it. 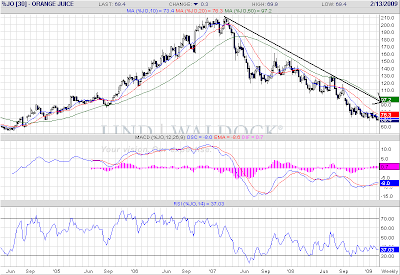 On the weekly chart, notice that prices have sold considerably from their peak at the beginning of this year. Also note that prices are near the trend line that they broke through near the end of last year on their way to bubble-land. Bottom line: this is a market that is moving lower. I wouldn't be surprised to see a bear market rally to the 10 and 20 day SMA. But that would be a reaction rally. Barring new fundamental developments, this is a market that is moving lower. The main story today is there really wasn't a major story. As the chart shows the market has rallied for the last 5 days. There are two uptrends. The first is a slightly upward sloping line that started last Monday. The second shows a steeper run that started last Thursday. Prices broke this trend on Friday and have been moving sideways ever since. My guess is the market is waiting for the stimulus debate to end and for the Treasury to unveil its plan to deal with toxic assets. Nissan Motor Co said it would cut 20,000 jobs and joined a growing list of automakers warning of red ink this year in what would mark its first loss since Chief Executive Carlos Ghosn took the reins a decade ago. The spreading global recession has put consumers off buying expensive goods and even if they wanted to purchase a car, financing has become difficult due to a dearth of credit. Saddled with excess capacity and headcount and with sales plummeting in developed markets, Japan's No.3 automaker has already taken a number of steps to cut production and staff, including through 1,200 voluntary buyouts in the United States. 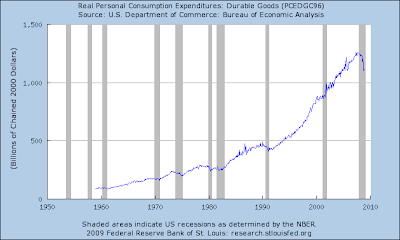 Above is a chart of real (inflation adjusted) personal spending on durable goods that goes back to the late 1950s. Notice the drop-off in durable goods purchases is unprecedented. That tells us the severity of the crisis facing the auto markers. 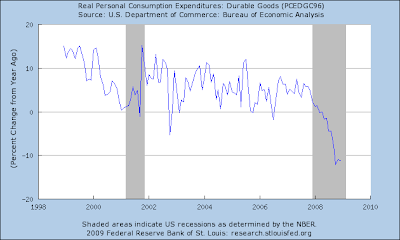 Above is a chart of the percent change in durable goods expenditures from the preceding year. Again, note the severity of the drop-off. This is cliff-diving. Above is a chart from Martin Capital Advisers of the two largest areas of durable goods purchases: homes and autos. Note that home sales have been falling for three years while auto sales have now tanked hard as well. The chart above is from Prophet.net and it shows the auto industry's overall chart. Need I say anything more? The administration's plans have evolved over the past several weeks as it has considered and discarded a host of ideas, with financial markets anxiously awaiting details. Mr. Geithner had planned an announcement Monday but delayed it a day to allow the focus to remain on the stimulus bill in Congress. The aggregator bank, which some refer to as a "bad bank," would be designed to solve a fundamental challenge: How can banks purge themselves of their bad bets without worsening their weakened condition? The entity would be seeded with funds from the $700 billion financial-sector bailout fund, but the idea is that most financing would come from the private sector. Some critical elements remained unclear, including exactly how the government would entice investors to participate in the private bank, given that they can already buy soured assets on the open market if they want to. 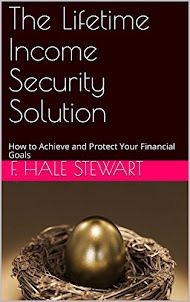 The government will likely offer some type of incentive, such as limiting the risk associated with buying the assets. Let's start with the basic problem: banks have a ton of assets on their books that are dropping (and have dropped) in value. As these assets have dropped in value, banks have had to write them down, or increase their loan loss reserves. When they do this they hurt their balance sheet, thereby preventing them from making loans. It's also important to point out that in a recession loan demand drops as well. However, the current structure of bank's balance sheets is certainly not helping matters. 1.) We keep the assets on the books: The problem with this option is we haven't done anything to cure the problem. The assets that are dropping in value and pulling capital away from a bank's capital base are still dropping in value and pulling capital away from the bank's capital base. The only way to cure the problem this way is to pour enough capital into a financial institution to account for the loss in value from bad assets and give the bank enough money to increase its reserves and thereby start making loans (if the demand is there). The fact that this hasn't happened yet indicates one of two things (and probably a combination thereof). We don't know the extent of the losses from bad assets and the cost is a lot bigger than we want to admit. Several commentators have mentioned the cost would be in the multiple trillions. While I personally dismissed these appraisals at first, they are starting to make more and more sense. 2.) We buy the assets and take them off the banks' respective books. This solution runs into a basic problem: valuing the assets properly. The first bad bank idea failed because there was no way to value the assets without leaving somebody holding the bag. If the bad bank paid market value they would force the selling bank to take too large a hit to its balance sheet. If the bad bank paid too much the taxpayer would be stick with the bill. A trend is emerging in both of these options: no one is coming out and saying the current value of a large swath of bank assets is a lot lower than anyone involved in the process wants to admit. That's the real central issue here. And until we deal with that no plan will be 100% effective. The Treasury's working theory for the government/private-sector partnership is that investors wouldn't overpay, because if they did, they'd stand to lose money; but they also wouldn't underpay, since the selling banks wouldn't be willing to part with their assets too cheaply. Here's a really big problem with the above idea: there is no guarantee any bank will sell the bad assets to the institution. While the investor (the government/business bank) may be thrilled at the possibility of buying really cheap asses, there is no guarantee banks will actually sell highly devalued assets to the bank. In other words, we're back at square one. I'm back. Let's take a look at the markets to see what the charts say. As always, you can click on a chart to get a larger image. This is the best looking chart of all the big indexes. -- The SMAs are bunched together which is never a good sign. However, the 10 and 50 day SMA are both moving higher which is a good thing. The IWMs (Russell 2000) is forming a consolidation pattern (as are the other three ETFs). Regarding the price SMA relationship notice he SMAs are in an extremely tight pattern with no discernable trend one way or the other. Also notice that prices have moved through all the SMAs, but (again) prices are in a consolidation pattern. After gapping lower in mid-Jamuary, the market moved into a broadening consolidation pattern. Like the other two averages the price/SMA picture is extrememly cloudy. Remember -- we want prices above all the SMAs, with the shorter SMAs above the longer SMAs and all the SMAs moving higher. That's the most bullish alignment possible. Here it's just a jumbled mess. Finally we come to the SPYs. There is an issue on this chart. The extreme candle of two days ago changes the pattern from a consolidation pattern to a broadening pattern. The issue I have with this analysis is that price is a statistical outlier; we didn't see a ton of price action in that area. Instead we have just one price point. However, either way we have an index in consolidation mode. Bottom line: these charts aren't going anywhere.